Today's book of poetry: A Pretty Sight. David O'Meara. Coach House Books. Toronto, Ontario. 2013. I was lucky enough to be at the Ottawa launch of David O'Meara's A Pretty Sight. His reading that night a Socratic howl and punk song with finger puppets. Of course I bought his book. And like the fan I am, got it signed. Got the puppets signed as well. But by buying David's book I disqualified it from my blog because I don't write about books I purchase. There you go. One of my favourite poets, a writer I've long believed is one of the best in the country. Luckily, a few weeks later, Coach House Books sent one in the mail. They sent along the finger puppets as well. of the deep,' like a burial at sea. the few last blocks on foot. when a sardine key gets twisted round. anyone would spend their last few hours. the whirling white like tickertape. still left to fill with explanation. O'Meara's is simply a voice I want to listen to. Henry Moore, Socrates, Sid Vicious and others come out to play as they bounce around and through A Pretty Sight. O'Meara has an air of certainty, an astute voice. He could wax eloquent and educated about the phone book and the results would be entertaining and enlightening. David O'Meara makes me laugh, makes me pay attention. When David O'Meara speaks other poets listen. In four short volumes O'Meara has become an essential Canadian voice and it would seem like he's just warming up. our helmets laid like eggs on the leather seat. their fins struggling in the killing air. A Pretty Sight is as engaging a read as you'll find in the poetry section. "Batons a message" were signs that the people left to help others find their way. Little sticks arranged to tell a brief, but important story. Josephine Bacon, in Message Sticks, is carrying on that tradition. She is leaving messages to help direct the people's way. tshika min a kau nitinniun? My limited typesetting and computer skills hamper the full expression of some of the Innu-aimon text and for that I apologize. But I thought it useful to see the poems as fully as possible. Josephine Bacon has distilled the necessary to a very few words. Ezra Pound would be proud. And in a very few words Bacon has found a clarity and a laser focus. The reader is never confused about Josephine Bacon's priorities. Message Sticks is broken up into six sections, all composed of very brief and untitled poems. But for Bacon brief never means terse. These aren't the poems of someone of few words but instead poems from someone who chooses her words with certainty and precision. "Batons a message/Tshissinuatshitakana, Josephine Bacon's first collection of poetry is one of those books you want to give to a friend saying, "Here, drink in this light.'" Josephine Bacon is an Innu from Betsiamites who now lives in Montreal, she is also a songwriter and documentary film maker. Today's book of poetry: The April Poems. Leon Rooke. The Porcupine's Quill. Erin, Ontario. 2013. 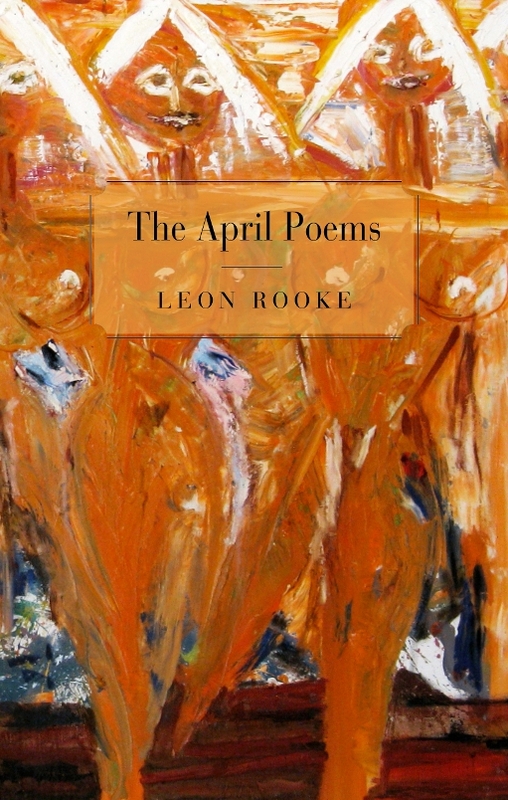 Leon Rooke's The April Poems are a bit like walking into a batting practice with the home-run champ. Leon Rooke's free verse musings on April explode off of the bat with the confidence of someone who always knows where the sweet spot lays. This guy is used to knocking them out of the park. —What was it that attracted you to April? suddenly made sense. Her pluck, her prink, her plumelets. things. I licked blue plates in cheap diners, thinking of her. to fly with her. Even wasps. —What was it about you that made her keen? Mother's Day an extended foray through Greek isles. —So you're saying your marriage worked out? —Like the beauty of pure math. What did she say? —Like juggling bricks in a hurricane. These poems abound with joy, passion and humour. In April, Rooke has clearly found his muse and it really doesn't appear to be the cruelest month any more. Lucky for us. I think it was, and predicted in the gospels. triplets seeded in gods knows what awful place. what can you expect from a bunch of Indians. Rooke is a free range kind of poet as The April Poems traverse football fields, Edgar Allan Poe, God's Haircut, Henry James and Walmart. But with a maestro at the helm — these disparate stories meld into a narrative that if not familiar to us all, is certainly enticing. And Henry James was weeping. I am not crying, point of fact. Go away, said Henry James. As Henry James sat brooding. Merrily Canadian. Or soon to be. I must see you clearly. I like your new book's title. I may enlist myself as your ambassador. Henry James ceased his weeping. I stand corrected, he said. Scant is the diff. Let's have tea. Leon Rooke is a Governor General's Literary Award winning novelist, a member of the Order of Canada, winner of the Canada/Australia Prize, the W.O. Mitchell Literary Prize, a CBC Fiction Prize and in 2012 he was the winner of the Gloria Vanderbilt Carter V. Cooper Fiction Award. Whoosh. Leon Rooke's The April Poems were a perfect Boxing Day treat for me. Refreshing, original and digestible without being overly stuffy. Even a sweet aftertaste. Announcing the first winner of the Kitty Lewis Hazel Millar Dennis Tourbin Poetry Prize. In the past several months I have read close to four hundred books of poetry. I must tell you all it is the most pleasant task I've ever set for myself. Splendid. As the year comes to an end I would like to thank each and every one of you who has supported this blog. And thank you, thank you, thank you to all the presses who generously sent work. Kitty Lewis runs Brick Books. Hazel Millar helms things at Book Thug. Both of these women went far beyond the call of poetic duty when I first started this blog. I cannot thank them enough, it was the support of these two women, and others like them, that gave me the confidence to actually keep doing it. Dennis Tourbin was a poet and visual artist and a dear friend. He was a fine poet and influenced I how see the world as much as any other person I've ever known. I miss him. So, the Kitty Lewis Hazel Millar Dennis Tourbin Poetry Prize. Or - the book I enjoyed most this year. As much as there were dozens of books that I thought were spectacular - this didn't take much thought at all. If I could only pass on one book of poetry from all my reading this year, Nora Gould would be the ticket. Hope Santa finds each and every one of you. Today's book of poetry: Jail Fire - The Life and Work of Elizabeth Fry. Julie C. Robinson. Buschek Books. Ottawa, Ontario. 2013. These very tender and thoughtful poems are Julie C. Robinson's answer to the question "who was the Quaker, Elizabeth Fry"? Robinson's answer is both surprising and rewarding. Clearly Robinson has done all her due diligence in researching the life of Fry, her work with women's prisons, her marriage, children – it's all in here and rendered with such delicate affection you might fear the poems will get away. Robinson does that thing that the best poets do, they tie you to their subject, the subject doesn't really matter, good poems make every subject interesting. believes they can be fanned into flame. offers salt of grace, oil of joy. Stone wall locks in cheaters. Two hundred crimes punishable by death. What about the limits of a woman's body? Fear of the male turnkey chars their hearts. Their hair stinks with anger. to make with their lips the chestnut shape of an O.
flutters and morphs into F,I,R,E. and love appears––solid, permanent, a guarantee. A testimony of warmth, they are no longer despised. Elizabeth Fry was a pioneer for prison reform, a dedicated Quaker, a woman of her time and a woman bravely ahead of it. These poems illuminate that life, they never lose their connection to the Quaker principles that guided Fry, but most importantly for the purposes of this blog –– these poems entertain. Robinson has inhabited Fry well enough to speak with her voice but never loses the poets' perspective. We do believe we are hearing Fry speak through Robinson. Who doesn't enjoy chasing geese off the lawn? opens the body to rhythm and breath. my nearest approach to flight. In the beginning, I realize, I embarrassed you. when your speech has never yet been side-ways. You do all with amounts of consideration. the currant between bloom and berry. and be rebuilt over there. As you know, I am a man of blunders. And maybe that is what I said. a thousand nuthatch burst from my chest. I have kept my promise, Elizabeth. but followed as far as I was able. I declare it the most beautiful of burdens. Jail Fire, Julie C. Robinson's first book, is a very mature piece of work. These poems are careful, but never calculated. They are precise and never preachy. These poems do what the best poetry always does, they entertain, they educate, they open doors you didn't know were there. the big picture, to offer a remedy. what darkness brings them to us, locks them in. that jut like roots on a path. when you are face down on the day? but bear our courage up. for the hem of a second chance. Sea Level is a conversational meditation about making a connection to the natural world - when the natural world seems to be so far away. This contemplative shortish long poem, or series of short untitled and connected poems (it doesn't really matter) bear none of the earnest back to the land paradigms we have come to expect. There is no polemic, curiosity and a keen mind are the focus. Hoogland muses about hoped for sightings of salmon eating wolves, a whale sighting, the footprints left behind by rubber boots and the ageless trails that animals weave through the bush. This mediation/conversation/poem is a bit like listening to your favourite wise Aunt, the one just a little sharper than her sisters. watch the beach scrub itself clean. This is not landscape, it is not outside us. Then – it's like we remember the sense of touch. of cedar to bunch at the nose. Sea Level was a finalist in the 2012 CBC Literary Nonfiction Awards. Cornelia Hoogland has published six previous books of poetry (see below to hear her read from Marrying the Animals), and two other chapbooks. She is Professor Emeritus of Western University. Baseline Press, London, Ontario's premiere publisher of chapbooks continues to astound with the beauty, quality and design of their books. Karen Schindler, the editor at Baseline, makes beautiful books. Sea Level was bound in a cover of St. Armand Canal paper with a flyleaf of Thai Mango paper. It was printed on Royal Sundance Linen 24lb. It doesn't make any difference to the writing but it certainly gives good writing a lovely home. Today's book of poetry: Waking In The Tree House. Michael Lithgow. Cormorant Books. Markham, Ontario. 2012. Michael Lithgow's Waking In The Tree House is a startling good first book. It's just damned good poetry period. And it reads like Lithgow is an old pro. These poems are written in a very conversational and accessible style and they all have the feel of having arrived fully formed. What was the fascination with fire telling us? in a bowl; moving the metal spoons slowly. like Johnny Torch –– flame on! before burying our hands in the sand. as we were, that we held a key to a beautiful secret. more than my room, more than my paper route. A lot more than my paper route. A conversational tone while easy to mimic is very hard to master. Lithgow excels. Again and again, by the end of a poem –– I was remembering the experience as my own. There's a very humanistic appeal in these Lithgow poems, there are moments of real tenderness that do not descend into trite nothings. Instead, you feel Lithgow really does have a finger on a hidden pulse we all move to. we've come for feeds us. The poems in Waking In The Tree House cover a wide gamut of subject matter ranging from the Old Jewish Quarter in Kracow and the rotting tooth of God to hiding one's own despair among the forgotten and unwanted relics of a dilapidated second hand store. But Lithgows' steady voice is constant. even whistle if you want. Not that you're alone. Michael Lithgow gives us his first book, and it is clear, he really does have his finger on some sort of collective emotional pulse, these poems often feel familiar on first reading, a deju-vu to the familiar. The spiders come in the late summer heat. waiting to capture what comes to the light. I confess, I brought love then later threw it out. wait for things, and I do it badly. of patience, patterns braided from belief. That the elusive things we need will come. And patience. Michael Lithgow is a patient poet, he never rushes anything, it is all build, build, build to the killer ending. Lithgows' very sure voice sets its' own pace. Slack Action is the title poem of this collection — and it's a hell of a poem to hang your hat on. I have family who work on trains and I hear how they talk about that world. I have always had a deep fondness for trains. Jeffery Donaldson says more about trains and fathers and fear and love in this one poem than you thought possible. It's remarkable stuff. a train of thought far from where he rode. free of his uncouplings. It took some sorting out. strapped, over to his chair or back to bed again. our new solitudes gathering and fanning out. I enter with purpose but am halfway off again. Our family is convergence and divergence both. knuckles ... ten feet and closing, five feet, good. cajoling his clogged arteries past eighty and beyond. let up in turn and spread fresh gaps throughout. clutching and unclutching down their length. the glide getting on in the inertia, itself still moving. he says, and lets his arms fall open around me. That's certainly one of the poems I've enjoyed most in the last year. Wow. You might be inclined to think the formal, technical rigidity displayed by Donaldson would make for formal, technical and rigid poetry – but nothing could be further from the reality of these verses. Although these poems are as precise as train tracks they read like rambling free flowing, free verse. A page of poetry on the table. to find out what it weights. I'm not a big fan of formal construction – but this is faultless stuff. It meets all my requirements in story telling, surpasses all expectations in fact. Jeffery Donaldson is an anachronism, a splendid one. Anachronism - a thing belonging to a period other than that in which it exists, especially a thing that is conspicuously old fashioned. Well, all of that is true, these are old fashioned poems – thoroughly contemporary and vividly alive old fashioned poems. Nature is a monument to itself, an open book. in forests of dark totems, with a knowing look. the sounding-within of all colours and smells. gets carried away in your dumbfounded head. Jeffery Donaldson's Slack Action was such a delightful surprise and a stern lesson. Good poetry can come in any form where there is a good poet at the helm. Whiskey Sour City - Vanessa Shields ed. Today's book of poetry: Bizarre Winery Tragedy. Lyle Neff. Anvil Press. Vancouver, British Columbia. 2005. Lyle Neff's Bizarre Winery Tragedy is a breath of fresh air, a cleaning of the cobwebs that clutter the closet of your brain. These short poems are precise, clear and on target. Although some see Neff as the owner of the big rant I thought these poems were tempered with wit and wisdom and the occasional wet Willy in the ear. If Neff were taking target practice - he'd be shooting ducks in a barrel. operation, was how she'd felt. A shotglass went her fire-orange fingernails. is such an enviable ride. "You should be an admiral, honey,"
smart sailor of the prevailing tide." Neffs sets them up and knocks them down. These poems work like quick little movies, short narratives, big results. Time and again I found myself nodding in agreement at the end of a poem, nodding and smiling. or that he's repulsed by what he's said. around his cheap spotless half-laced runners. As roots bust its back, all through your childhood years. Nor blacknesses that make flares into shadows. Penumbra of sibilant points mapped around you. And be strong: blindnesses ending, work to be done. It started with the first poem in this collection and the rollicking ride never slowed down or let up. Lyle Neff's Bizarre Winery Tragedy was such an enjoyable and entertaining read that as soon as I type this all out, post it on the blog - I'm going to read it all over again. Never used to get so sick so often. This grey stubble in patches is also new. pale scrabbly ant, handsome as the foamy surf. Today's book of poetry: Psychedelic Norway. John Colburn. Coffee House Press. Minneapolis, Minnesota. 2013.
has brought us there, and you can have it. Thank god for this book." she "came out of it"
Are you fricking kidding me. This poem hit me like a punch in the face. I was very dubious of Amanda Nadelburg's bold statement. Now I bite my tongue. John Colburn's Psychedelic Norway is a little like hearing John Coltrane's 'sheets of sound' for the first time. It's all in there, the past, the present, the hoped for future and the sense of loss. It is all bopping around and flashing out like sun-spots. For this reader the individual lines became less important than the over all, the cumulative effect of Colburn's words as they bend the reader to their will. The reader is constantly bombarded by the kaleidoscope focus which seemingly encompasses everything from the beginning of time. Colburn's vision is crisp, crisp, crisp, but his panorama is sweeping by at light speed and on first read can be a bit of a blur. Saturday morning I fought the poison of sleep. Hands came through the small window next to the door. Later, I realized I did not. I drank cold tea and ate crackers for breakfast. Two blue herons walked in the swamp where the horse track had once been. Rain and snow do not have a house to live in. A fish does not have a house to live in but lives in a specific area of water. A cloud lives wherever a cloud lives. A hoofed animal has limitations these days. Room 11 featured a dirt floor I covered with a black mat from Wal-Mart. To my left was Alan, Room 10. To my right was Jones, Room 12. The hallway made by a low wall was otherwise open to the elements. It was illegal for me to enlist during the course of my probationary period. I read a pamphlet regarding the etiquette of tourism. Never stand and stare at any happening. Never ask an interesting-looking individual if he or she is an artist. Do not attempt to direct traffic. The period of my probation was indefinite, pending yearly review. A moth flew into my throat. I was using myself up. Some animal experts claim that pigs exhibit emotions, including shame. I walked the corridors between various information centers, then to the inner district. I sat near the Angel of Milk Park, disguised as a dangerous candy. Birds were free to leave the country. They followed migratory pathways in the sky. "Hello," I said to the women who passed. One replied but continued walking. I bought a day-old at the bakery. They heard some music and started popping. A jeep bounced into the curb and flipped over. "All is well," I told the crowd. The decisions an elephant makes in one day. The bus station was near Mill Park. We were legally required to wear orange shirts. Five of us, spread throughout the seats of the bus. I leaned my head against the window. A man named Frank sat next to me. He held a paperback book. It was illegal for me to visit a lending library. That was poem 1 in a sequence of 31 that make up the long poem sequence 'pre-occupation'. Colburn seems to be re-discovering the universe with every new line shooting a different phosphorus trail to a new reality. There really isn't a narrative thread to follow. The experience of reading these poems is something like weightlessness, that moment on a trampoline where you hit the apex, the top of your bounce and for one instant are beyond the rules of gravity - before gravity and reason weigh you back down to earth. Colburn has some of the sorcerer in him and as much as these poems can be playful there are moments when something profound is being asked, dark challenges are being made and the reader is cajoled to Colburn's will. but it is one hell of a carnival ride of a read. Worth full price of admission and then some. John Colburn lives in Northeast Minneapolis. Today's book of poetry: Rituals. Rae Armantrout. above/ground press. Ottawa, Ontario. 2013. This short chapbook by Rae Armantrout from the ever industrious above/ground press, is proof pudding that good things do come in small packages. This thin work and these terse poems play much bigger than they first appear. Armantrout's succinct style reminds me of a car that's been chopped, channelled, tuned. Everything unnecessary has been torn out, cut away, thrown out. What you are left with are the essentials for acceleration, thrust. Maybe an automobile analogy is the wrong way to go but these poems are lean and crisp. To paraphrase Ezra Pound, Armantrout is purifying the language of the tribe. When did you unlearn this? Rae Armantrout's most recent book Just Saying was published by Wesleyan University Press in 2013. Prior to that - Versed, (Wesleyan, 2009), won the Pulitzer Prize, the National Books Critics Circle Award and was a finalist for the National Book Award. Armantrout's publications and awards form a list as long as your arm. The astounding above/ground press, which is run by the tireless Rob McLennan, continues to astound by publishing some of the best writers on the planet. These non-descript, photo-copied, gems probably form one of the better catalogues in the small press world. Rituals was Rae Armantrout's second above/ground press title as she had previously published Custom in 2012. Rae Armantrout reading from her Pulitzer Prize winning book Versed. From 92 Street Y.